The coastal option leads from Rijeka by Adriatic Highway, passes Senj, Karlobag all the way to Starigrad-Paklenica (180 km from Rijeka). Zadar is 46 km to the south of Starigrad. The continental option is very easy. It leads from Zagreb by highway to Maslenica (junction of the Adriatic road) and further on to Starigrad-Paklenica (270 km from Zagreb). Approximately 200 m from the hotel Alan there is a narrow asphalt road turning off the main road towards the village Marasovići (there is the sign “National Park Paklenica” at the very spot where the roads branch off). 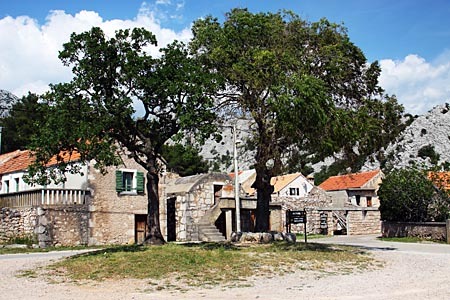 Just after passing Marasovići you will see the entrance to the National Park. From here you can drive 2 more km to the parking lot and this parking lot is taken as a starting point for most of the described climbing routes. Here starts the path that leads through Klanci (the narrowest part of the gorge), and after a half hour walk you will reach Anića luka, the place where the gorge turns into a large valley just under the Anića kuk rock face. The path continues up to the mountain hut and the upper section of Velika Paklenica.